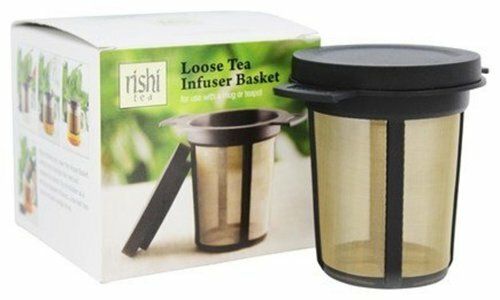 Rishi Tea Loose Leaf Tea Infuser Basket is a convenient way to brew any loose tea or herbal infusion. The extra-fine mesh filter makes this infuser basket suitable for all teas, including herbal teas and rooibos. The depth and diameter of the basket allows for a proper infusion and affords tea leaves the room they need to unfurl and release their flavours over multiple infusions. Rishi Tea Loose Leaf Tea Infuser Basket is made from stainless steel mesh and has a heat-tolerant frame; it fits most mugs and teapots.